Original programs - online versions Software developed for the original Visual Quantum Mechanics project. Requires an old version of an Adobe plug-in. Original programs for download and offline use Software developed for the original Visual Quantum Mechanics project. Mac OSX and Windows versions. 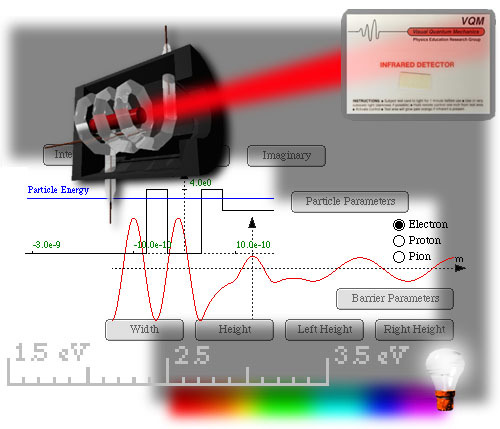 Hydrogen Spectroscopy Visualization of energy levels in the hydrogen atom in IR, visible and UV. Zeeman Effect Interactive visualization of an energy model for atoms in a magnetic field. Franck-Hertz Experiment Visualization of the electrons motion and light emission in the experimetn that shows quantization of energy. Making Waves A series of programs to visualize interference of classical waves.